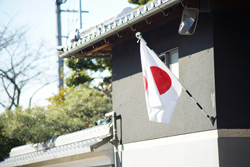 February 11 is National Foundation Day, a national holiday for Japanese people to remind themselves of the nation's founding and foster their love for the nation. Before World War II government offices and schools throughout Japan held all sorts of celebrations on Kigen-setsu, but after the war, the holiday was abolished for various reasons. Still, many voices lamented its passing, so that in 1967 the day was again made a national holiday as National Foundation Day.